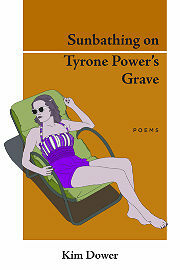 "Sunbathing on Tyrone Power's Grave by Kim Dower brims with the vitality and preoccupations of everyday living. Life and death are inextricably entwined in Dower's poetry: the distinct grief of losing a parent, bidding farewell to a pet, but also the joys of naming a puppy and the pleasure of using a favorite fountain pen. While the death of her father hovers over Dower's fourth collection, the focus is on remembering the good times and celebrating the small victories that add up to a productive day. From the comic irony of a grocery store clerk commenting on her "beautiful aura" to the keen sense of accomplishment when successfully parallel parking her car, Dower pays tribute to the power of mundane everyday activities to spark happiness and wonder. Dower's wicked sense of humor fuels poems about alternative facts, the indignities of air travel and the misunderstood color pink. Pockets of anxiety open up here and there, with lingering concerns over mental decline. In "Letters to My Son," as profound a piece as anything Dower has ever written, she admits to a primal fear of losing her mind to dementia. An L.A. transplant from the East Coast, Dower was named City Poet of West Hollywood, Calif., in 2016 and held the post until 2018. The title poem features Dower's father's favorite actor, Tyrone Power, a swashbuckling American icon from the '40s. The cemetery where he is buried among other Hollywood royalty is a place of celebration, awash in sunshine, memories of great movies and "angels in bikinis smoking KOOL Lights." Kim Dower’s poetry has a way of transforming everyday life into something luminous and unexpected. Simultaneously accessible and complex, whimsical and heartbreaking, Dower’s poetry shines with subtle irony and playful imagination, written in a way that is empathetic and relatable, as well as full of wisdom. Something about Kim Dower’s poetry always seems trustworthy.